Bacca has proven divisive at times. He’s received criticism from coaches, former players, and more for being too one-dimensional and not moving enough off the ball. Most recently, after being benched by Montella for a “confrontation,” he came off the bench to score yet again (and the “confrontation” and benching was poorly reframed as a simple squad rotation.) This summer, there were talks of him leaving Milan mounted due to him being our most marketable player, the sale of whom we would allow us to buy multiple other players at different positions. Some fans were against his move at all costs, others were happy to see him go. But whichever side of whichever argument you were on, the stats are something that can’t be argued. The player who left La Liga as the most efficient player, with the most goals scored per shots ratio (yes, ahead of Messi and Ronaldo,) has now set a Serie A record with 23 goals scored from 45 shots on goal. He is Milan’s very own assassin. With that new record achieved, I’m curious as to where people stand on the needs more service vs. needs to move more off the ball argument. Are you okay with him being so clinical and carrying the team in goals last year and now this year already? Do you think he should change his game and improve more off the ball? Do you think he needs more service and support from the midfield? Take the poll, choose as many as you like, then feel free to expound in the comment section. 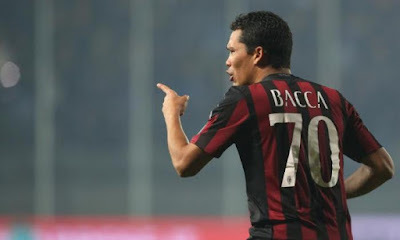 Bacca has a lot of nicknames, like “Fox” or “Jackal,” but with his clinical efficiency on target, I think that the ones like “Sniper” or “Assassin” suit him best. Certainly, after all that Milan have been through, it’s nice to have our own Assassin up front.